The 2019 Spokane Youth Lacrosse season is about to begin. We're very excited about the new season and know that you are too. Please thoroughly read the email below for the information you will need this season. 1. Polo Fields. 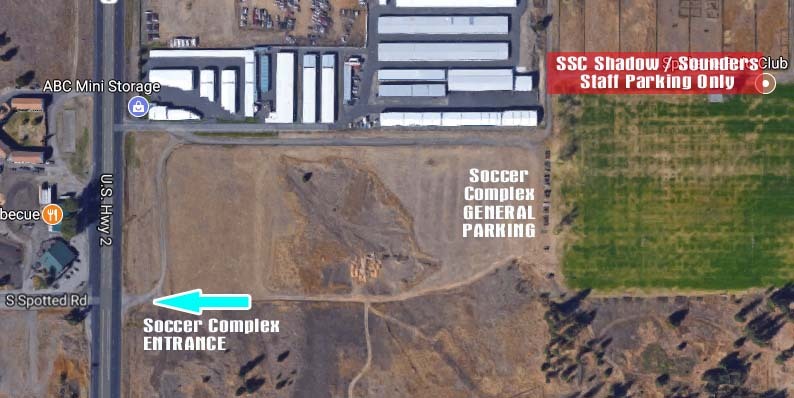 All league games are at the Polo Fields, 7714 W Sunset Highway, Spokane WA 99224. Spokane Shadow manages the Polo Fields. Please be respectful of our landlord's property. Pets (other than registered service animals) are prohibited at the Polo Fields. Alcohol, tobacco and drugs are prohibited. 2. Parking and Field Access. Use the driveway on east side of the property, which is marked with traffic cones. Last spring, ABC Mini Storage closed off its driveway (the paved driveway on the west side of the property) that had been used in the past to access the parking lot. There is a map below. The lacrosse fields are located at the north end of the field. Parents and spectators must park in the main parking lot at the south end of the property. DO NOT PARK on the grass playing field. Anyone using the access road on the westside the property will be towed. The parking lot and driveway are in rough shape. It was graded recently, but is still in poor shape. We're trying to work with Shadow to improve this. 3. Seating. In lacrosse, spectators sit on the opposite side of the field from the team benches. Do not sit behind the team benches or in the end line areas behind the goals. Sit across from your team's bench, at least five yards back from the sideline. 4. Field Designations. There is a field diagram below. The field locations will change. For now, Field 1 is for boys 5/6. Field 2 is for boys 7/8. All girls games will be on Field 3. Boys 1/2 and 3/4 will be on the Flag Football Field (Field 4). These changes have been made to the online SYL schedule and on each of the team pages. 5. Field Set Up. Your coach will be asking for volunteers to help with field set up. On the schedule there are designated home and away teams. The home team is listed first. The first HOME team of the day for each field is responsible for setting up the fields with a table, 2 chairs, scoreboard, cones, end line balls, timing instruction sheet, air horn, and timer. There is a big red container of white balls for the boys and another red container of yellow balls for the girls. The last game of the day, the designated AWAY team is in charge of putting all of these items back in the shed. Cones are placed on the corners of the field, the edges of the coaching box/scoring table area, and the intersection of the midfield line and sideline on the side opposite of the scoring table. Three balls are placed on each end line, and one at the scoring table. It should take about 20 minutes with two people working. Please put things neatly back in the shed. 6. Scoring Table Volunteers. Each team will need to supply one volunteer to work at the scoring table. This will involve keeping time for the game clock, timing penalties and keeping score. 7. Animal Pens. Please stay away from the animal pens to the west of the fields. 8. Garbage. Garbage and recycling cans are located near each field. Please use them. Please help your coach pick up all water bottles and other garbage around the bench area after each game. 9. Fundraiser Meeting. Please see the email sent earlier regarding the fundraiser. 10. Sportsmanship. We hope that everyone (kids, parents, and coaches) will have a fun-filled season. Please promote good sportsmanship and act as good role models by remaining positive on the sidelines. It is inevitable that the referees will miss calls and/or make calls you don't agree with. However, please remember they are doing their best, they have trained, certified and tested.